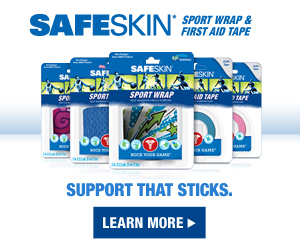 Home » Health & Safety Channel » General Safety Center » First Aid » What Should A Sports First Aid Kit Contain? Match the contents to the sport: The type of first aid that may be required varies by sport. Because bruises, abrasions, and sprained ankles are more common in baseball, a baseball team's first aid kit, for instance, needs to be stocked with cold packs, elastic bandages, and Band-Aids, while a track team's kit needs to have plenty of supplies to treat blisters, abrasions, pulled muscles, and sprains. If your team is going to be in the sun, carry sunscreen; the cross-country coach needs to carry an allergy kit to manage bee stings. Stock a realistic quantity: Be prepared to treat more than one child at an event. For younger children, remember to stock pediatric doses (in liquid form, if necessary). Ensure ready access: First aid supplies should be placed where they are readily accessible, and marked clearly to allow rapid identification. Use Ziploc-type bags within the kit for extra materials and to sort your supplies. For instance, it is helpful to partition supplies into modules "for wound care," "for an allergic reaction," and so forth. Protect against damage: Carry supplies in a watertight container designed to withstand years of rough handling and extremes in temperature, such as a plastic (Pelican case or Otter Box) or metal container equipped with a rubber O-ring gasket for a tight, waterproof seal. Listed below are what a sports first aid should contain. Go through this list carefully, and make a decision to include or exclude these items from your medical kit. Have a medical professional teach you how to take care of your players, so that when the time comes, you will know how to apply a Steri-Strip to close a wound, mold a Sam Splint to support a sprained wrist, or use a pocket mask to perform rescue breathing.